A former staff of Federal Ministry of Mines and Steel Development, Mr. Isaac Alaji Agbanwu, has been arraigned by the Independent Corrupt Practices and Other Related Offences Commission (ICPC) for allegedly misappropriating the sum of N14, 500, 000 belonging to the Cooperative Society of the ministry. 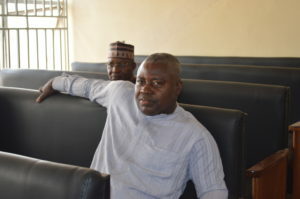 Agbanwu who was the Chairman of the ministry’s Thrift and Credit Cooperative Society Limited Nigeria, is facing a 4-count charge before Honourable Justice Gaba Venchak Simon Of High Court 34 of the Federal Capital Territory (FCT), Kwali. The Commission said his actions, bordering on criminal breach of trust, embezzling of funds and using his office to confer undue advantage upon himself, violated Sections 311 and 308 of the Penal Code Act, and punishable under Sections 312 and 309 of the same act, and Section 19 of the Corrupt Practices and Other Related Offences Act 2000 and punishable under the same Section. Counsel to ICPC, Michael Adesola, told the court that the accused allegedly misappropriated the money which was proceeds of the sale of land in Midhill Estate, belonging to the cooperative society. He was also alleged to have used a company, Zomitech Engineering Limited Company, where he held private interest as a director, to undertake the layout design and setting out of Midhill Estate. The accused person pleaded not guilty to the charges when they were read to him by Justice Simon. His counsel, Ikechukwu Ikogwe, asked the court to grant him bail based on the fact that he cooperated fully with the investigation. He also averred that his client did not show any recalcitrant attitude throughout the course of investigation. However, ICPC’s counsel, Adesola, opposed the bail application arguing that the accused had been threatening and intimidating witnesses in order to stop them from coming to testify in court. Having listened to the submissions of both parties, the trial judge ruled that the accused person be granted bail in the sum of N500, 000.00 (Five Hundred Thousand Naira) with two sureties in like sum. The sureties he said, must be residents within the court’s jurisdiction and attach their two recent passport photographs to the bail form. In addition, one of them must be a director in the public service and as well submit an evidence of appointment into the service. The case was adjourned to 20th May, 2019 for commencement of trial.